Greek life at Cornell has a rich history rooted in the rise and fall of literary societies during the late 1800s and early 1900s. Cornell’s first literary society formed in 1853, just days after the founding of the institution. Between 1853 and 1927, more than 20 literary societies followed suit. Literary societies enriched the intellectual and social life of students, presenting talks and debates; essays; poetry; and dramatic readings and critiques. The larger literary societies also maintained extensive libraries. Like literary societies, secret societies appeared during the early years of the college. Some of these groups affiliated with national Greek organizations, despite institutional policies prohibiting the existence of such organizations at Cornell. 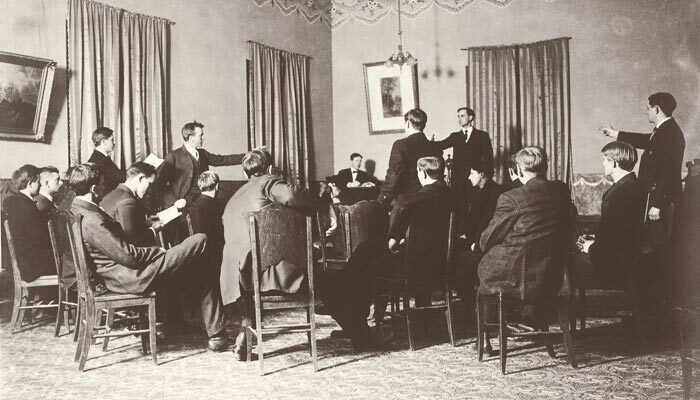 As secret societies and other student organizations (intramural sport teams, for example) gained popularity, literary societies began providing more social activities and developing elaborate initiation rites in order to renew student interest. Their attempts were unsuccessful. By 1927, just 11 literary societies remained, all of which voluntarily disbanded that year. At the dissolution of literary societies, Greek organizations announced their existence and sought official recognition from the college. Despite their initial reluctance to recognize the groups, the faculty voted in favor of recognizing six female and seven male Greek organizations in 1929. Officially recognized as “social groups,” Greek organizations at Cornell were asked to renounce their affiliation with national Greek organizations. More than 30 social groups, now called “fraternities and sororities,” have come and, in most cases, gone over the years. Today, Cornell officially recognizes seven fraternities and eight sororities, several of which have existed since 1929. Like their predecessors, the groups remain unaffiliated with national Greek organizations, making Greek life at Cornell unique from its counterparts at other institutions. Milhauser, C. J. (2003). Cornell College: 150 years from A to Z. WDG Communications: Cedar Rapids, IA. Thomas, R. H. (2004). Cornell College: A sesquicentennial history. WDG Communications: Cedar Rapids, IA.